Beyond ENSO: new signals of seasonal to interannual predictability | Climate Etc. 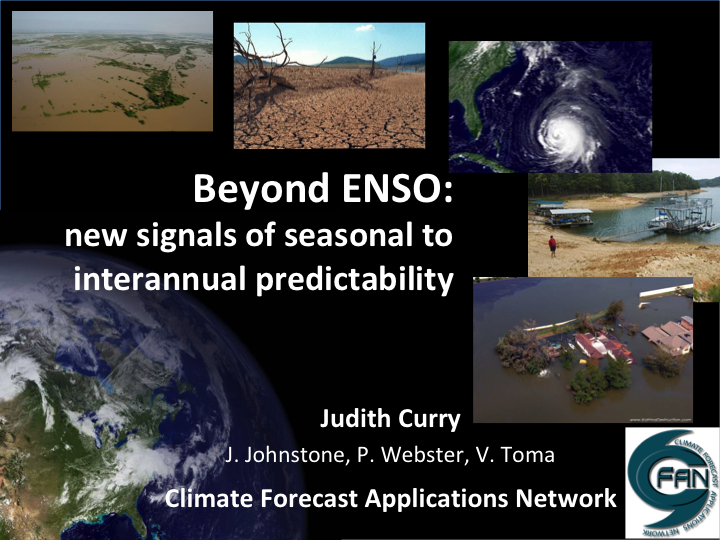 My new talk on improving seasonal to interannual climate predictions. This week, I am attending the Weather Risk Management Conference (WRMA) in Miami. In providing forecasts for the private sector, I’ve come to realize that there is a gap between climate forecast information and the needs of users. Even if the scientific community believes certain information is valuable, users may not. There is also a gap between how users value forecast information compared to its quality. CFAN has focused its forecast efforts on bridging this gap, by providing predictions of extreme eventsand objective assessments of forecast confidence. 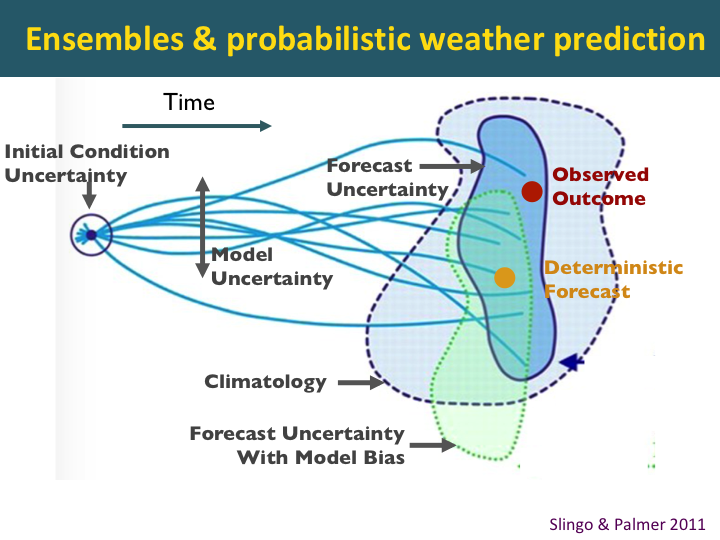 This figure illustrates the concept of probabilistic weather forecasting, using a global ensemble model prediction system. For each forecast, the global model produces an ensemble of multiple forecasts, initialized with slightly different conditions. The ECMWF model has an ensemble size of 51 forecasts. A single forecast (say the gold dot) may be rather far away from the actual observed outcome (the red dot). If the ensemble is large enough, meaningful probabilistic forecasts can be provided. The objective of the probability forecast is to bound the observed outcome (the red dot) in a probability space (reflected by the darker blue region) that is much smaller than climatology (the lighter blue region). The actual model prediction is characterized by the green region. The potential predictability of the model is characterized by the dark blue region. This potential predictability can be realized in a prediction through forecast calibration and ensemble interpretation techniques. The challenge for probabilistic climateprediction is that in order to encompass the observed outcome, the ensemble size needs to be very large and becomes as large as the climatology. The challenge is even greater when climate is changing, such as the slow creep of global warming or an abrupt shift in a climate regime such as the Atlantic Multidecadal Oscillation. 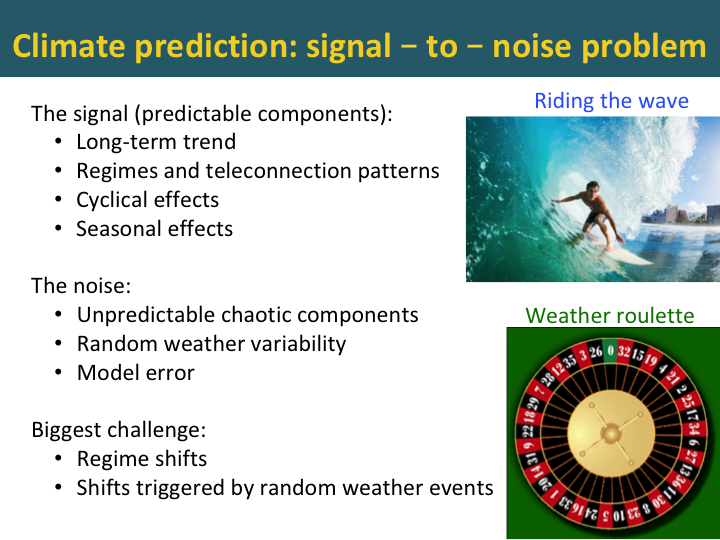 For weather prediction timescales of 2 weeks or less, ensemble prediction methods can provide meaningful probabilities. This time horizon is being extended into the subseasonal time frame, potentially out to 6 weeks. However forecasts beyond two months often show little skill, and probabilistic forecasts can actually mislead decision makers. 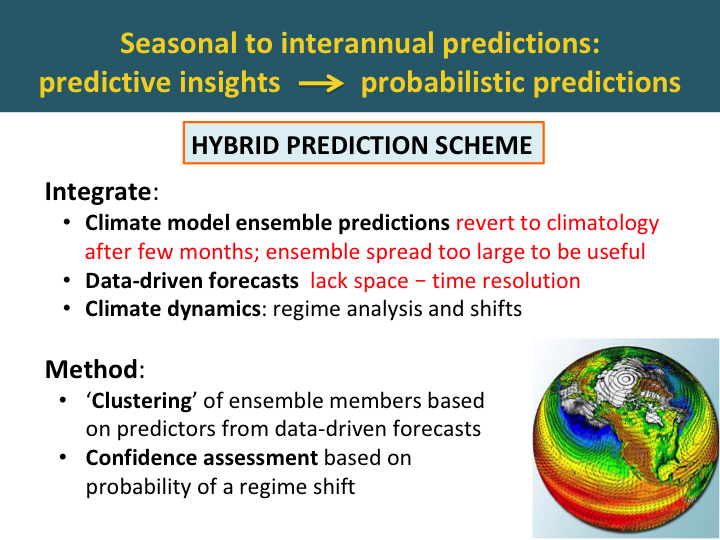 On seasonal time scales, predictive insights are typically provided, whereby a forecaster integrates the model predictions with an analysis of analogues and perhaps some statistical forecast techniques. A predictability gap is seen around 1 year, where there is very little predictability. At longer time scales some predictably is recovered, associated with longer-term climate regimes. However at longer time horizons, predictions become increasingly uncertain. Possible future scenarios can be enumerated but are not ranked, e.g. because of ambiguity. A useful long range forecast keeps open the possibility of being wrong or being surprised, associated with abrupt changes or black swan events. Anticipating abrupt changes or black swan events would be most valuable. 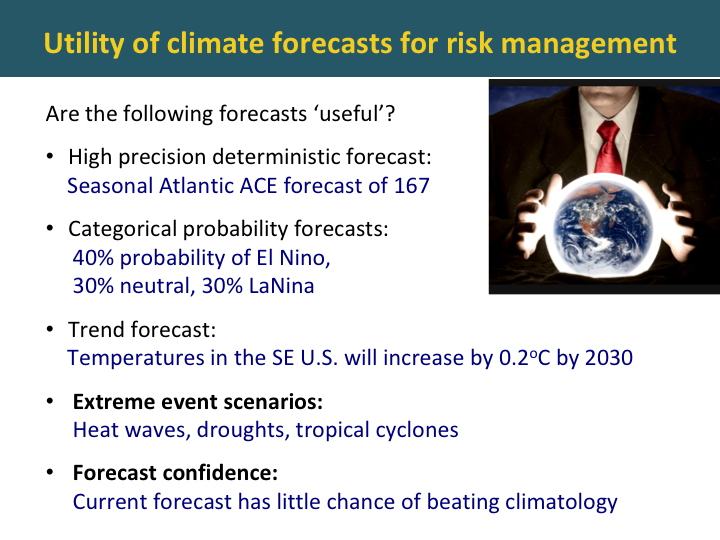 The key forecasting challenge is is to extend the time horizon for meaningful probability forecasts, and to extend the time horizon for predictive insights of the likelihood of future events. How can we extend these forecast horizons? Improvements to global climate models are helping extend the time horizon for meaningful probabilistic forecasts. This slide compares El Nino Southern Oscillation forecasts from the latest version of the European model with the previous model version. The y-axis is the initialization month, and the x-axis represents the forecast time horizon in months. The colors represent the strength of the correlation between historical forecasts and observations. The most notable feature of this diagram is the spring predictability barrier. If you initialize a forecast in April, it will rapidly lose skill by July, and the correlation coefficient drops below 0.7 (which is reflected by the white region). However, if the forecast is initialized in July, the forecast skill remains strong for 7 months and beyond. 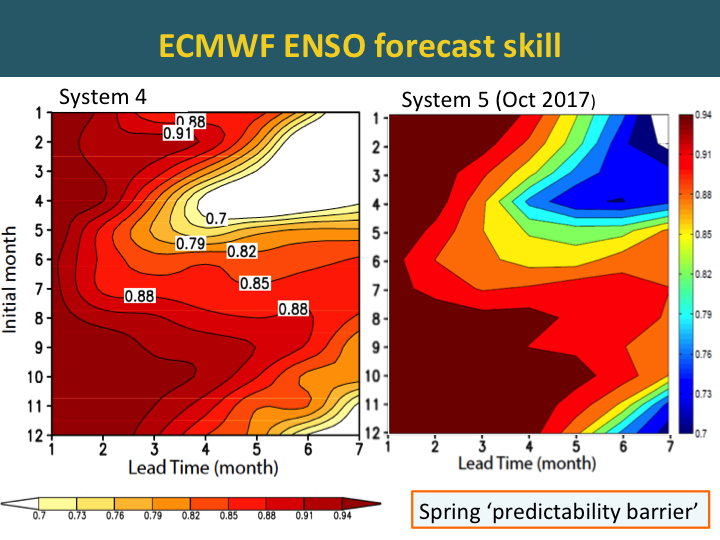 The skill for the new version of the ECMWF forecast model is shown on the right, and we see substantial improvement. While the color schemes are slightly different, you can see that the white region, indicating correlation below 0.7, is much smaller, indicating that the model performs much better during the springtime predictability barrier. The improved skill in Version 5 is attributed to improvements to the ocean model and also to parameterizations of tropical convection. Once you identify and isolate the predictable components, you can ride the wave. The biggest challenge is regime shifts, particularly when the shifts were triggered by random events. You may recall that in 2015, it really looked like an El Nino wanted develop. However, its development was thwarted by random but strong easterly wind outburst in the tropical Pacific. This failed 2015 El Nino set the stage for the super El Nino of 2016. Climate prediction: can we beat climatology? The big challenge in making a climate prediction is whether you can beat climatology. Forecast skill depends on several things. 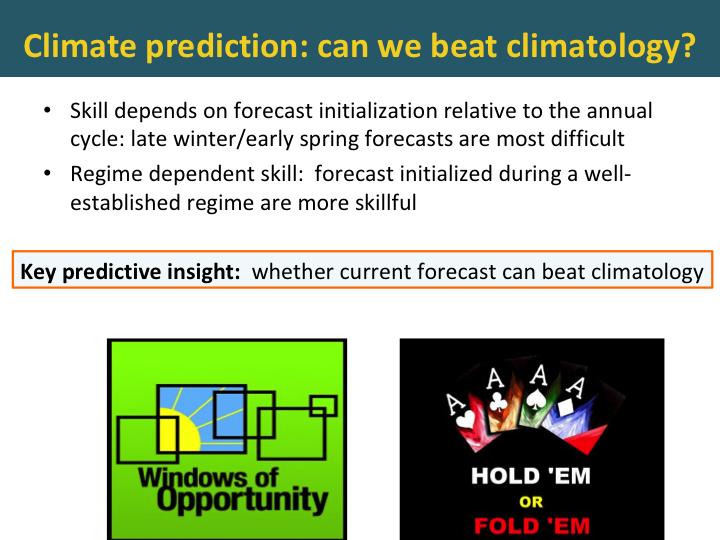 When the forecast is initialized relative to the annual cycle is an important determinant of skill. Also, a forecast initialized during a well-established regime, such as an El Nino, are more skillful. The forecast windows of opportunityapproach identifies windows in time and space when expected forecast skill is higher than usual because of the presence of certain phases of large-scale circulation patterns. I often use a ‘poker’ analogy when explaining this to energy traders – you need to know whether to ‘hold’ or ‘fold’. In forecasting terms, this is the difference between a forecast with high or low confidence. Statistical forecasts have been used for many decades before global climate models were developed, notably for Asian monsoon rainfall. Traditional statistical forecasts have been time-series based or based on past analogues. While these methods do include insights from climate dynamics, they have proven to be too simplistic and there are an insufficient number of past analogues. The biggest challenge for statistical forecasts is that they stop working when a regime shifts. You may recall in 1995 when Bill Gray’s statistical hurricane forecast model stopped working, when the Atlantic circulation pattern shifted. A more recent example is use of October snow cover in Siberia as a predictor of wintertime temperatures, this one also stopped working once the climate regime shifted. Currently, big data analytics is all the rage for weather and climate prediction. IBM’s Watson is an example. 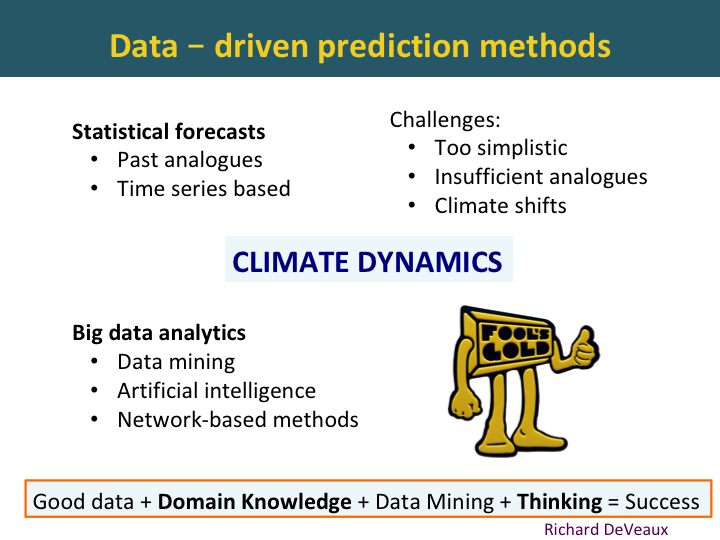 Mathematicians and statisticians are applying data mining and artificial intelligence techniques to weather and climate prediction. The limiting ingredients are domain knowledge andthinking. 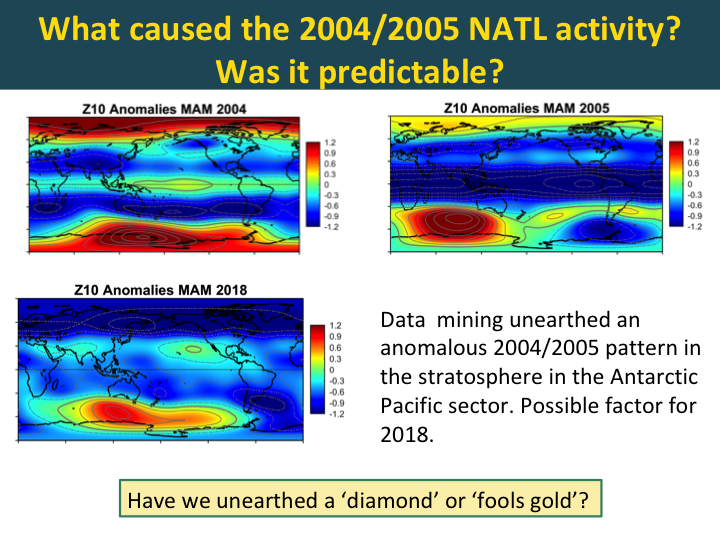 Without a good knowledge of climate dynamics, fools gold will be the fruit of any climate forecasts based on data mining. The way forward in pushing the time horizon further for meaningful probabilistic forecasts is to integrate global climate model forecasts with insights from data driven forecast methods. The problem with climate model forecasts is that they invariably revert to climatology after a few months. The problem with data driven forecasts is that they lack space-time resolution. These can be integrated by clustering the climate model ensemble members based on predictors from the data-driven forecasts. Confidence assessment can be made based on the probability of regime shift. In data-driven approaches to climate prediction, it is essential to understand the range of climate regimes that can influence your forecast. These regimes indicate memory in the climate system. The challenge is to identify the appropriate regimes, understand their impact on the target forecast variables, and to predict future shifts in these regimes. CFAN’s analysis of climate dynamics includes consideration of these 5 time scales and their associated regimes, ranging from the annual cycle to multi-decadal time scales. An intriguing development is underway in the Atlantic. 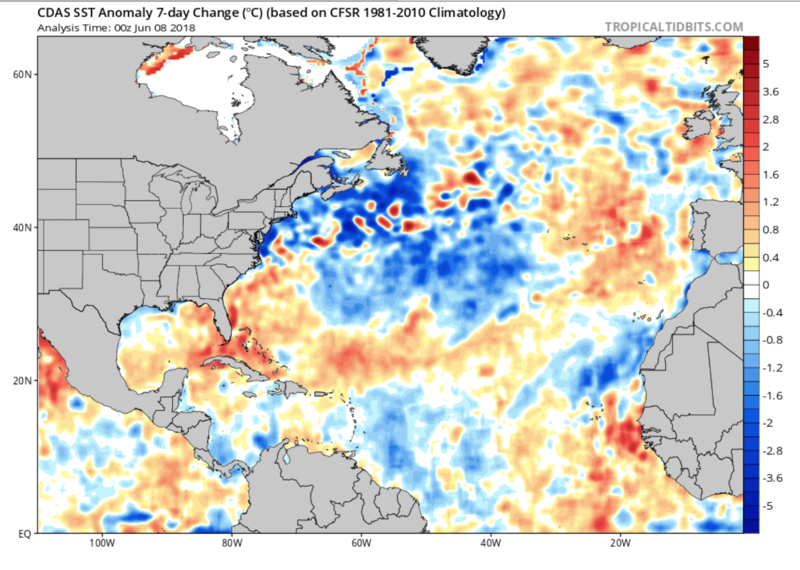 This figure shows sea surface temperature anomalies in the Atlantic for May. You see an arc of cold blue temperature anomalies extending from the equatorial Atlantic, up the coast of Africa and then in an east-west band just south of Greenland and Iceland. 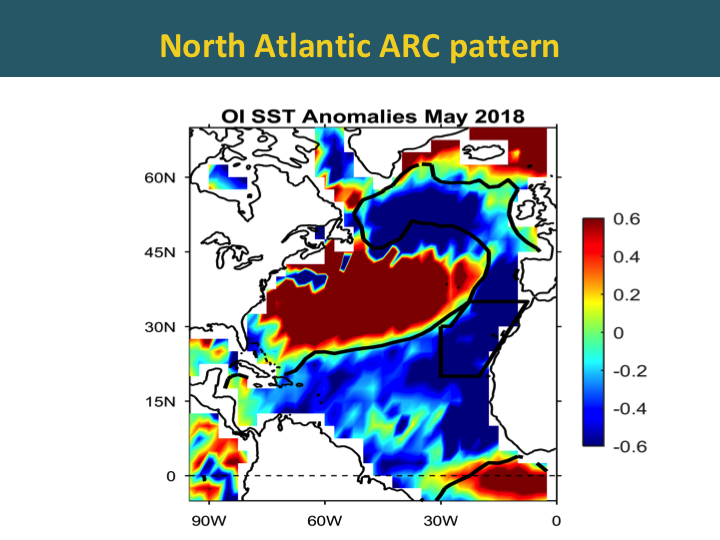 This pattern is referred to as the Atlantic ARC pattern. On the bottom graph, you see that the ARC temperatures show a precipitous drop over the past few months. Is this just a cool anomaly, similar to 2002? Or does this portend a shift to cool phase? CFAN’s research has identified precursors to the shifts, we are actively assessing the current situation. 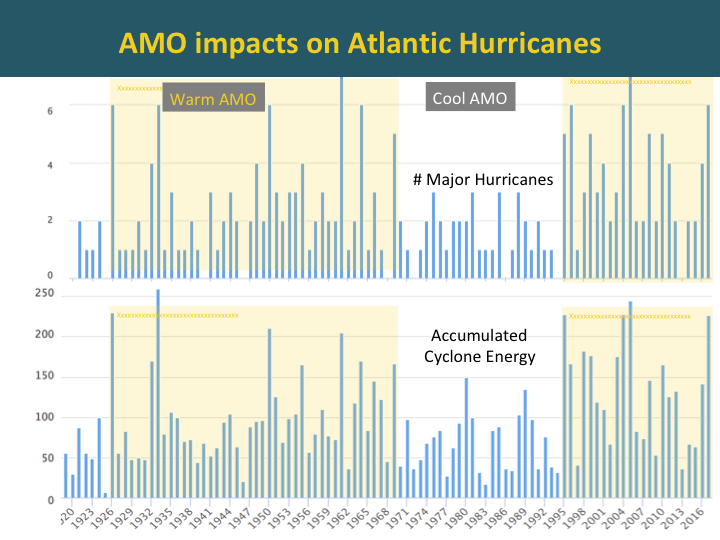 A similar effect of the AMO is seen on the Accumulated Cyclone Energy. 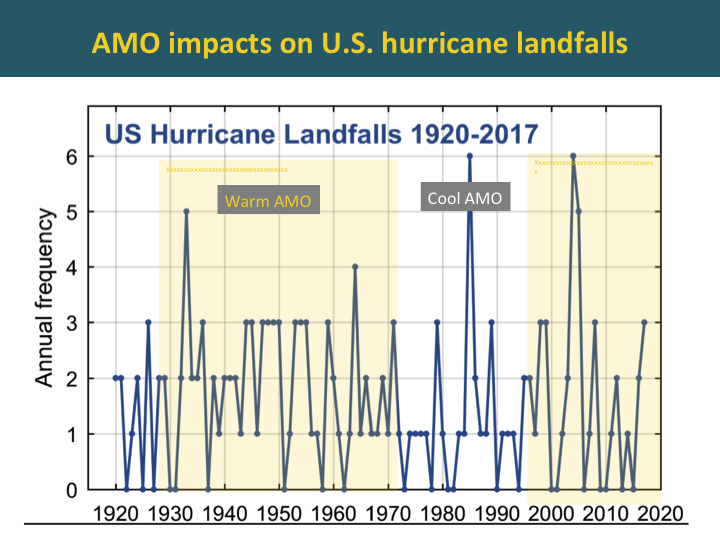 By contrast, you see that the warm versus cool phases of the AMO has little impact on the frequency of U.S. landfalling hurricanes. 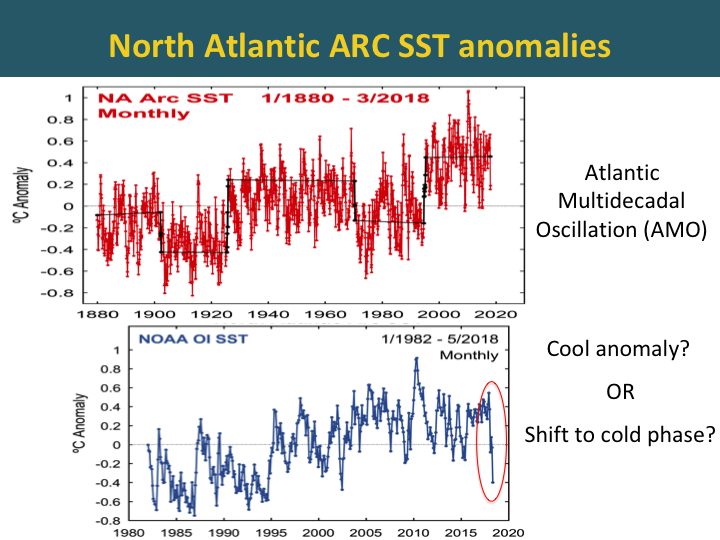 However, the phase of the Atlantic Multidecadal Oscillation has a huge impact on Florida. During the previous cold phase, no season had more than 1 Florida landfall, while during the warm phase there have been multiple years with as many as three landfalls. A major hurricane striking florida is more than twice as likely during the warm phase relative to the cool phase. 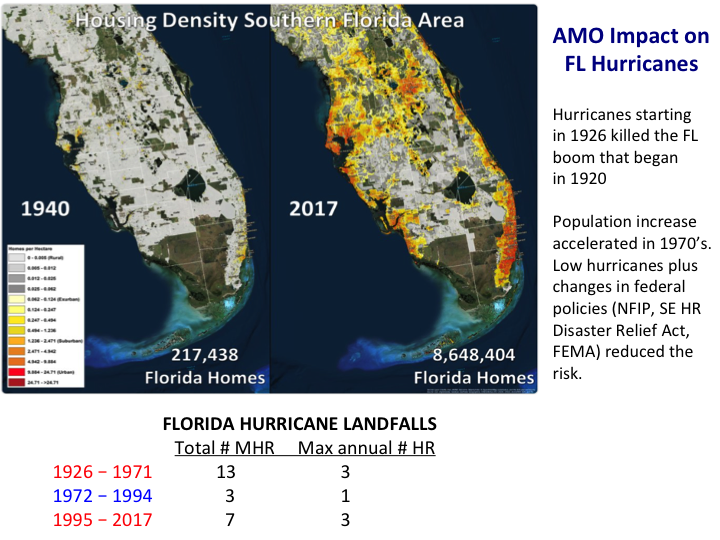 These variations in Florida landfalls associated with changes in the AMO have had a substantial impact on development in Florida. The spate of hurricanes starting in 1926 0’ killed the economic boom that started in 1920. Population and development accelerated in the 1970’s, aided by a period of low hurricane activity. CFAN’s approach examines global and regional interactions among ocean, tropospheric and stratospheric circulations. Precursor patterns are identified through data mining, interpreted in the context of climate dynamics analysis, and then subjected to statistical tests in hindcasts. The period since 2008, characterized by a predominance of El Nino events, occurring every 3 years. 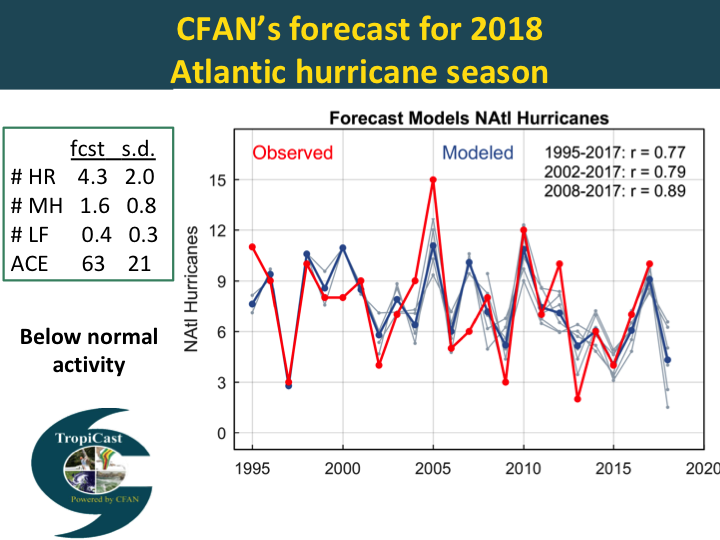 Last week, we issued our third forecast for the 2018 Atlantic hurricane season. 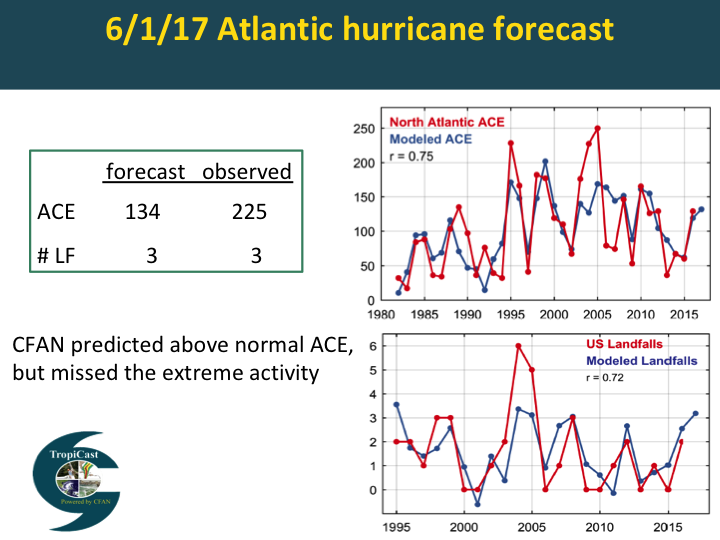 We are predicting below normal activity, with an ACE value of 63 and 4 hurricanes. The figure on the right shows hindcast verification for our June forecast model for the # of hurricanes. The forecast is developed using historical data for 3 different periods, corresponding to the 3 regimes described earlier. 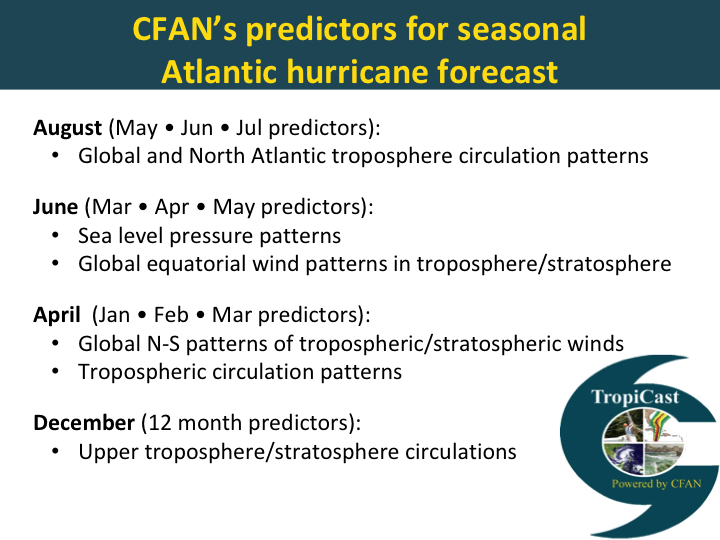 CFAN’s seasonal predictors are identified for each forecast using a data mining approach, with different predictors used for each lead time. 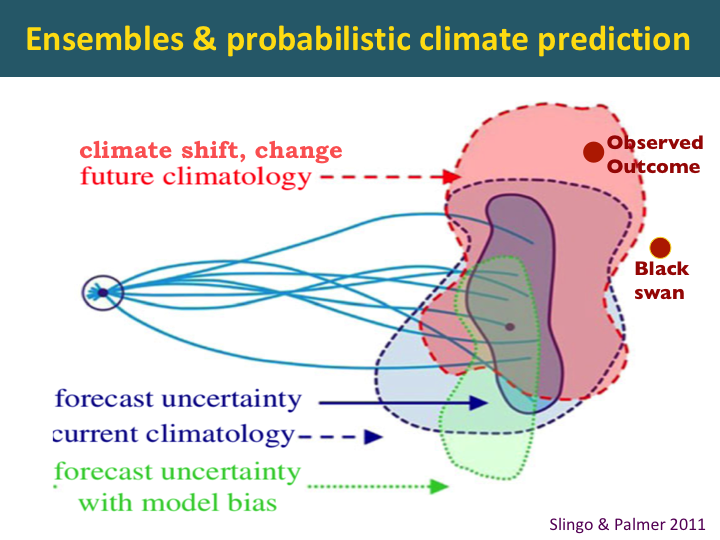 The candidate predictors are then subjected to a climate dynamics analysis to verify that the predictors make sense from a mechanistic point of view. The predictors that we use are predominantly related to atmospheric circulation patterns. Note, our predictors differ substantially from other groups providing statistical forecasts, who rely primarily on sea surface temperature and sea level pressure predictors. Here is the forecast we made a year ago for the 2017 Atlantic hurricane season. We predicted an active season with 3 U.S. landfalls. We got the number of U.S. landfalls correct, but we substantially underestimated the Accumulated Cyclone Energy, or ACE. From the perspective of the financial sector, the key issue is whether we will see another extremely active hurricane season and how that will translate into U.S. landfalls. We conducted a data mining exercise to identify patterns that explained the extremely active seasons in 1995, 2004, 2005, 2017. Our current forecast model does capture the extremes in 1995 and 2017, but not 2004 and 2005. The only predictor that popped up for 2004/2005 is a pattern in the stratosphere near Antarctica. At this point we have no idea whether this pattern could provide a plausible physically based predictor for Atlantic hurricane activity. The disturbing thing tho, is that polar stratosphere predictors predict an extremely active 2018 season in contrast to the other predictors we are using. So at this point we don’t know weather we have unearthed a diamond or fools gold. In any event, this is a good example of both the promise and perils of data mining. Congratulations for going well beyond the usual climate talking points to science. I’ll be back. The lower end of the color code of the right hand forecast skill graphic is blue btw. I thought this was a good example of erstwhile authors being forced to dissemble and dance around the idea that perhaps the sun might play a role on local weather and maybe even some bearing on regional weather but certainly not across an entire hemisphere, let alone globally. This was a key study for me. Low solar activity causing cold winters in England? The question is how. The answer emerges from the polar region with modulation of surface pressure. High pressure changes wind patterns from more zonal (east/west) to more meridional (north/south). With greater penetration of cold and stormy polar conditions into lower latitudes with meridional patterns. It has significant implications for northern higher latitude temperature – and the central England temperature record is perfectly placed to observe this pattern. And we can see how the cumulative NAO – the Atlantic expression of the Arctic Oscillation – projects onto both the AMO and AMOC. Both the latter are the result of altered heat transport – patterns of ocean circulation – caused by changes in zonal or meridional winds and not primary causal agents themselves. Solar activity is thought to project as a factor onto polar surface pressure through solar UV/ozone interaction in the middle atmosphere translating through atmospheric pathways to polar regions. Based on the extended hypotheses of process level computer models. So I would not be surprised if there were stratospheric signals – although I can’t ‘unearth’ it from the information provided. It fits the conceptual model of these mechanisms as stochastically forced resonant internal responses. Something I have seen described as Lorenzian forcing – defined as a small change triggering a large internal response. The 20 to 30 year patterns – occurring in the context of millennial variability – it has been suggested – least of all by me – is related to the Hale Cycle of solar-magnetic reversal. Projecting onto part of the polar surface signals – UV changes in the Hale Cycle bias the globally coupled system to specific outcomes. Cumulative values of the AO and AAO suggest solar Lorenzian forcing of the system – but this this is still unpredictible. Another Russian doll within a Russian doll. New ENSO models are coarse scale climate models providing boundary conditions with nested finer scale models in specific regions. This is conceptually the way to do it – with probabilities derived from multiple runs . I have done similar things with 3-D ocean models – although the objective there was typically to derive parameters for diffusion modeling. ENSO models do well once patterns have emerged and far less so at this time of year when patterns are changing. That has not changed and will not until the fundamental mechanisms of ENSO are better defined. … the primary causal agents being, more/less clouds? The Pacific is the largest source of cloud variability. It seems at least in part a coupled ocean/atmosphere mechanism involving Rayleigh-Bénard convection in a fluid heated from below. I misunderstood the question. Whatv causes the AMO? Multi-decadal variability in the Pacific is defined as the Interdecadal Pacific Oscillation (e.g. Folland et al,2002, Meinke et al, 2005, Parker et al, 2007, Power et al, 1999) – a proliferation of oscillations it seems. The latest Pacific Ocean climate shift in 1998/2001 is linked to increased flow in the north (Di Lorenzo et al, 2008) and the south (Roemmich et al, 2007, Qiu, Bo et al 2006) Pacific Ocean gyres. Roemmich et al (2007) suggest that mid-latitude gyres in all of the world’s oceans are influenced by decadal variability in the Southern and Northern Annular Modes (SAM and NAM respectively) as wind driven currents in baroclinic oceans (Sverdrup, 1947). You cannot predict a black swan but black swans occur nonetheless. I am amused to see an attempt to predict a black swan in the envelope. If it is a black swan it is by definition outside the envelope. All you have is a prediction of an extremely unlikely event . Which is something quite different, and predictable. You give a model with a prediction and then change it to another model based on these values. All you have is a new model with an unknown further prediction based on whatever went wrong with the current reinterpretation. Don’t get me wrong. I am a big fan. As the chiefio and chaos suggest the weather is prone to the occasional surprise. Best to give a block quote and qualify with a subject to updates approach. Better to try and fail than never to try at all and most of the time you will be right. Just remember those Italian scientists before offering too strong a guarantee. Now, this is somewhat OT, but still about the predictability of global temperature indices (and riding the wave). The hadcrut4 global index is low-pass filtered using triple running means of various cutoff frequencies (wavelengths of 20, 25, 30 and 35 years). Derivatives are used and scaled to show the slope (trend) of the low-pass filtered temperature indices in °C/decade. Is it not easy to (roughly) predict what happens next? I like the conceptual framework in light of the last example. Sort of a formalized version of what Joe Bastardi does in his head from long experience. One reason why Florida’s population grew very fast between 1960 and 1980 was the large flow of Cuban refugees. In my family’s case my mother and sister arrived in 1968 and moved to Fort Lauderdale. I was living with a family which had taken me in in the NY suburbs, and moved to Florida the summer of 68. My grandparents escaped later that year, and my dad escaped 10 years later in 1978. I also read we had a significant influence on the development of south Florida as a trading hub because we were mostly middle class, spoke Spanish and came from a trader culture. One thing we noted was that housing built in the 1950s was much better built than later housing. Being aware of how hurricanes destroy buildings we tended to buy older houses with cement block walls and solid tiled roofs. That type of house will last forever. That’s interesting. I’ve noticed as well houses built in the thirties flurries and fifties are built to last. This is slightly off subject but still relevant. There have been two significant hurricanes this year. One in Hawaii and one in Guatemala. I’ve tried to find out how much ash was spued into the air to no avail. Does ayone have information on this? Will these volcanoes effect the climate or are they spuing to little to make a difference? Oh nevermind, I found my answer in a new Newsweek report. May have a very small cooling affect. They are considered small volcanoes. What does CFAN predict exactly? I know hurricanes and typhoons. Does it predict, for instance, draught in the SW? Wet regime in Europe? I’m guessing along the lines of wet/cold climate VS hot/dry climate? Colder winters vs hotter summers visa versa? More or less snow and rain? To my knowledge IBM’s Watson just answers simple questions, using text analysis. People are touting neural nets, since these are basically analog-like pattern recognition machines and weather has patterns. I am not optimistic about either approach. Z10, I see the red blob and the scale, no description, what is it temperature, blocking pressure ? The period is MAM does that set the Atlantic up as being the predominant cyclone basin, or the intensity.? 2005 and 2018 have one thing in common so far, both started with an East Pacific hurricane. Researching Z10 on a small cell ph is not easy. Good question, and one of several examples for specific reasons for uncertainty in specific situations (not vague appeals a la “ignatology”). There are in fact competing predictions, some presented with great confidence, are there not? oops: “agnatology” in place of “ignatology”. Agnotology relates to cognitive bias and not scientific uncertainty. There is a great deal of both. Have we unearthed a diamond or a fool’s gold? 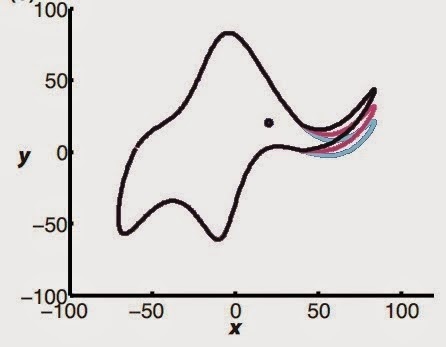 Von Neumann’s elephant with 5 five complex parameters. His trunk really wiggles! Latest GFS has no such TC at all. Just a slight depression, which is what I’m afraid I’m coming down with. I predict that for every successive decade, the land and oceans will warm, and CO2 will rise even if solar irradiation is lower. I have predicted this every decade for the past three. This is too easy. I wonder how many people still think that CO2 is not the primary forcing. The combination of AGW and internal variation produced an incremental rate of warming in the latter part of the 20th century of 0.1K/decade. Not in itself an existential threat. And one that may diminish this century with a 7% reduction in solar UV possible. 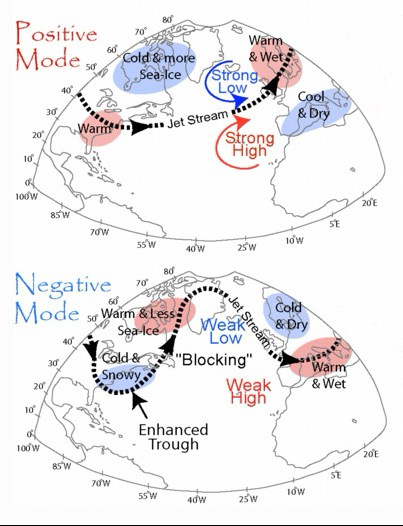 This would translate into more negative polar annular modes, more north/south blocking patterns and substantial Northern Hemisphere (NH) cooling – this NH winter may be a taste of things to come – and enhanced upwelling in the eastern Pacific (Oviatt et al 2015) – bringing global cooling. But chaos introduces an intractable uncertainty that preclude any simple prognostication. The place to look for uncertainty is in the deepwater formation zones of the north Atlantic that are implicated in abrupt and catastrophic change over the last 800,000 years. Notwithstanding simple and inherently silly climate memes. Are you writing about net solar irradiation? or just incoming? Net has not been measured very long and still isn’t measured very well. So little cloud feedback – so much measured change. 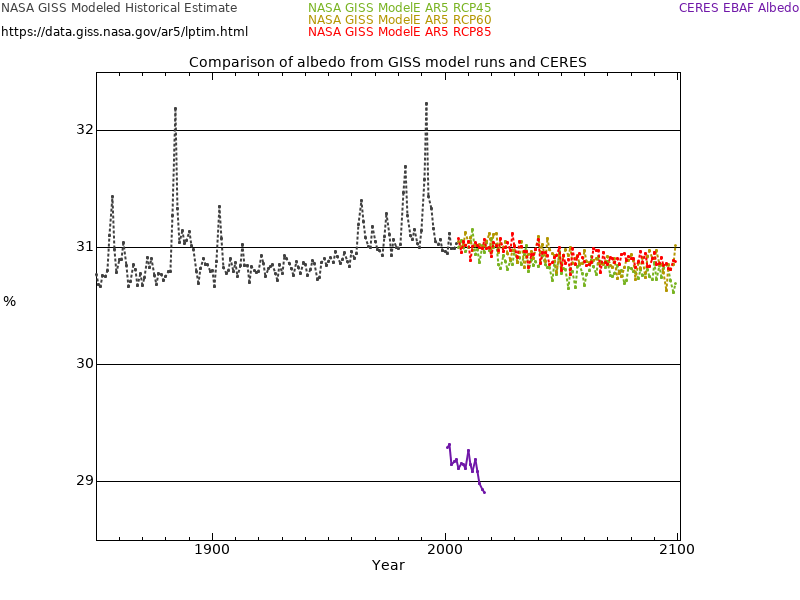 The earlier segment of the graph is completely inconsistent with ERBE and ISCCP. I doubt that the land and oceans have warmed much, we really do not know as the statistics are completely unreliable. But if they have warmed it is not due to CO2, because the atmosphere has only warmed a small amount, and that was due to the giant ENSO cycle. See my http://www.cfact.org/2018/01/02/no-co2-warming-for-the-last-40-years/. Increasing GHGs such as CO2 can only warm the surface by first warming the atmosphere, where they act. This has not happened. The records of land and oceann temperature allow us to create spatial PREDICTIONS, of the temperature where there are no measurements. There are two ways we test they reliability of these predictions. error due to spatial sampling is negligible, but interesting nonetheless. There are number of on going projects to recover old data. What I can tell you is that the “new” old data demonstrates that the spatial predictions work. Using sparse networks we can predict the data in places where there are “no” mesaurements. I use “no” in italics because in csome cases we “hold out” the data to test the model, and in other cases there is data, but it hasnt been turned into digital records. The total precipitable water graph in Daily graph section last one Arctic sea ice blog has provided interest for a year. One is able to see hurricanes forming out near Africa a week or more before nearing USA. It shows currently a very large amount of water about to hit/hit Japan. Expect a big news item [if in Japan]. Or is it Trump meeting Kim? Nonetheless I could see the swirl building up 2 weeks ago that now has given us 16 ml in country Victoria Australia 2 days ago. The thing about these patterns though is how unpredictable they are though they give the semblance of predictability. Four to 6 plumes of water going out in either direction from the Equator like giant fan blades of asynchronous and asymmetric length and anachronistic time. A Hurricane will strike a coast near the same area every 30 years on average, which year, which coastal area? Good luck with the predictions/assessments of risk. They El Nino did occur in the second second six months of the year, the traditional method of record the 2 meter anomaly, NCEP CFSR / CFSv2 identified a July peak of .25 and a progressive rise in peaks through to .8 in December. Importantly in El Nino home turf, the Pacific hurricane season was the second most active since 1992, eleven of the sixteen became major hurricanes, second highest ACE at 286 units, the season went unusually late and other records. It looks like the ocean heat release got dealt to on its own doorstep, limiting the traditional impacts on anomalies. Would this be a fair assumption. I forgot to include, three H4 hurricanes active similtainously. Dear Judith, would you please let me know where I could find the original figure (or figures) about house density in 1940 vs 2017? The resolution of your figure is not very good, can’t read clearly the legends. Thanks in advance, and good luck with your talk. likely have significant impacts on the evolution of the large-scale circulation (Fig. 1;derived from Meehl et al. 2001). 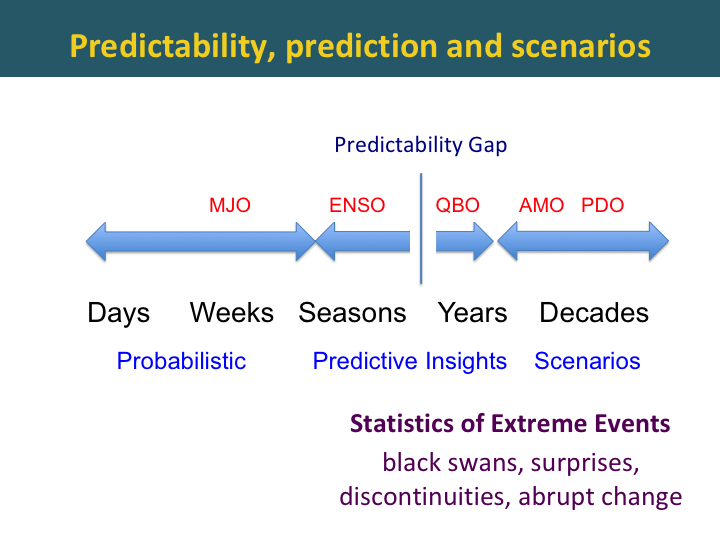 Probabilistic forecasts from nested, initialized, multi-scale models may enable us to get beyond ENSO. Talking of ENSO – what happened to that el Nino some of us were predicting?